(Crockford-Pigeon Mountain Wildlife Management Area). Photo credit: Alan Cressler, USGS. Dr. Woodhams contributed to strategic planning for research and monitoring for the salamander chytrid (Bsal) at a workshop headed by the Powell Center, United States Geological Survey. 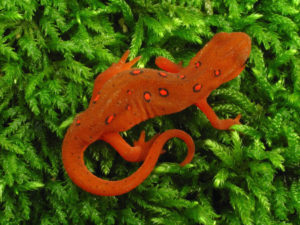 The workshop was the first international meeting to address the threat of Bsal to salamander populations in the United States, with more than 30 participants from U.S. conservation and resource management agencies (U.S. Fish and Wildlife Service, U.S. Forest Service, U.S. Department of Defense, U.S. National Park Service, and Association of Fish and Wildlife Agencies) and academic research institutions in Australia, the Netherlands, Switzerland, the United Kingdom, and the United States. Grant EHC, Muths E, Katz RA, Canessa S, Adam MJ, Ballard JR, Berger L, Briggs CJ, Coleman J, Gray MJ, Harris MC, Harris RN, Hossack B, Huyvaert KP, Kolby JE, Lips KR, Lovich RE, McCallum HI, Mendelson JR, Nanjappa P, Olson DH, Powers JG, Richgels KLD, Russell RE, Schmidt BR, Spitzen-van der Sluijs A, Watry MK, Woodhams DC, White CL. (2015) Salamander chytrid fungus (Batrachochytrium salamandrivorans) in the United States—Developing research, monitoring, and management strategies: U.S. Geological Survey Open-File Report 2015–1233, 16 p., http://dx.doi.org/10.3133/ofr20151233.